It is a fact that until recently African American actors were almost nonexistent in war movies. This is quite unfair since they were also fighting for their country. Even though they are not omnipresent in today´s war movies, they seem to get a fairer share. The makers of Generation Kill faced quite some questioning as to the reasons why there was no African American cast in the series. As fishy as this may have seemed initially there was a very good explanation for this. Generation Kill is based on the true story of the First Recon Company, a highly specialized troop, in which there were actually no African American soldiers, or only one, as we can deduce from the group photo in Evan Wright´s book. The questioning however was very justified since there is really no war movie on contemporary conflict in which there are no African American actors. Be it Battle for Haditha, Redacted, The Hurt Locker, Stop-Loss, Home of the Brave and many more. There are always African American actors and this is highly justified since many of the troops are of said origin. How does the situation look regarding other wars? For example Vietnam? When it comes to combat movies – with the exception of We Were Soldiers – black soldiers are very often present. The best example is certainly Hamburger Hill that has a big African American cast. But they are not absent from Platoon or Full Metal Jacket either. Now what about We Were Soldiers? I honestly don´t know. Since it is based on a true story it might be possible that there were no African American soldiers in that company. If anyone knows the reason, tell me please. WWII is another story altogether. Looking at the massive production of WWII movies it is incredible how absent African American actors are. Sure there are a few exceptions. A Soldier’s Story that I reviewed a while back is a good example. 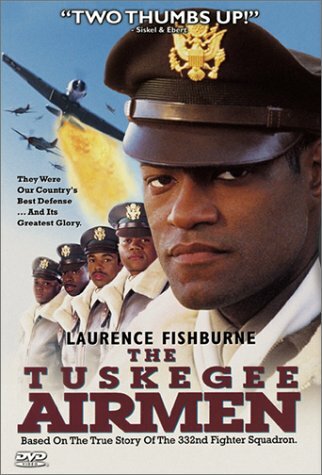 And then we have the Tuskegee Airmen based on the true story of the African-American 332nd Fighter Group of the Army Aircorps (see my movie review). This fine movie illustrates how unjustified the belief was that Blacks were not capable of flying modern fighters. But apart from these two examples? And what about Flags of our Fathers? It´sad to say that there were 900 black troops participating in the battle of Iwo Jima but not one of them is represented in Eastwood´s movie. He has been questioned many times and asked to clarify but he did not reply. This infuriated many people, among them the film director Spike Lee. I think his Miracle at St. Anna might be a direct response to Eastwood´s omission. It is actually incredible but the absence of African American actors in Flags of our Fathers makes Pearl Harbor look good in comparison. At least Cuba Gooding Jr had quite an important role. Spike Lee´s just mentioned Miracle at St. Anna focuses on the 92nd Infantry Division that fought in Italy. This division was the result of the segregation of the times. It was a purely African-American division, also called Buffalo soldiers (I must admit that I have not seen Miracle at St. Anna but read many reviews that did NOT appreciate it). I think we are still waiting for a truly good depiction of African American participation in WWII. And WWI? I am lost. Have no clue if there ever was a WWI movie with African Americans in it. Let´s rewind some more: The Civil War. And yes here we finally find an outstanding movie with a largely African American cast. One of my Top 10. Yes, I am talking about Glory. If you haven´t seen it yet, watch it. Looking at the whole picture again we can say, it is getting somewhat better, but a contemporary movie, based on a conflict younger than the civil war, with an African American main actor is still outstanding. 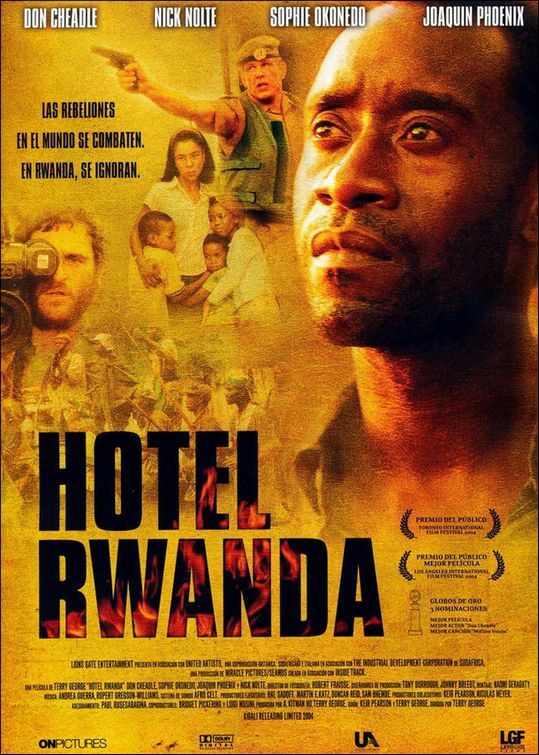 Now, don´t mention Hotel Rwanda (Don Cheadle was actually also in Hamburger Hill). Although it is an impressive movie there was really no chosing a white main actor. Not even Clint Eastwood would have had the insipidity to do so. This entry was posted in Essay, Movie, Reflections, War Movie and tagged A Soldier´s Story, African American Actors, Battle for Haditha, Essay, Flags of our Fathers, Full Metal Jacket, Generation Kill, Glory, Hamburger Hill, Hotel Rwanda, Miracle at St. Anna, Movies, Pearl Harbor, Platoon, Redacted, Reflections on War Movies, Tuskegee Airmen, War Movies, We Were Soldiers. Well, thanks a lot. That is very nice of her and of you too. Hope you come by and visit often. If you have suggestions, topics, movies, let me know. Just glancing through the Military History “100 Greatest” I see just a few with significant black characters: The Dirty Dozen, Full Metal Jacket, Apocalypse Now, Platoon, and Glory. Interestingly, only Glory is non-fiction. I have to come to Clint Eastwood’s defense. It is one thing to shoe horn a black character into an accurate historical war movie like “Letters” and another to have a black character in a war movie that is not based on a true story. I personally have never read anything about black participation in Iwo Jima and I have read a lot about the battle. There were blacks involved, but not in any significant combat role. To force them into the movie to be racially sensitive is a slap at history, in my opinion. Much worse than what Eastwood did or did not do are the war movies that had no good reason to not have a significant black character because they are fictional. Examples would include “MASH”. A little shocking because it was obviously made by liberals. It’s been a while since I have seen it, but I think “Casualties of War” might be another example. I do not recall a major black character in it. “Three Kings” would be a good example of making sure one of the key characters is African-American and appropriately so. As far as “Generation Kill”, I have mixed emotions. It is based on a book and is very faithful to the book, but I think I would look the other way if they added an African-American to reflect their role in the war. The audience would not care if the skin color of one of the characters was changed for this purpose. None of the characters are famous, after all. The Eastwood movie that caused offence is Flags of our Fathers. There are testimonies of black soldiers (900) who were involved in the mission. http://www.guardian.co.uk/world/2006/oct/20/usa.film. Furthermore Eastwood did not want to answer when questioned. Why not? Especially when it comes to WWII it would have been high time to mention their participation as the article I attached correctly states. I think when it comes to Generation Kill it is excusable as they really wanted to stay true to the composition of the depicted platoon. In any other case…It is not OK and I do certainly not excuse Clint Eastwood. I apologize. I was referring to “Flags” when I made my comments (I have not seen “Letters”). I stand by what I said. I see your point of view and I am sympathetic toward African-American soldiers, but I still feel it would have been forcing them into a movie where they did not belong. It does not surprise me that Eastwood would have refused to get into a debate with Spike Lee. I have to point out that the U.S. military was segregated until Korea (especially the Navy and Marines), which means any depiction of a platoon, for instance, should not include black characters. That’s part of the reason why you only see them in movies like “The Dirty Dozen”. I would argue that because of this racism, Hollywood should be looking for opportunities to put significant black characters in post-WWII war movies. As I recall (it’s been a while since I saw it), there is at least one in Eastwood’s “Heartbreak Ridge”. I was going to watch Heartbreak Ridge one of these days and will let you know, if you remember correctly. Now that’s quite a comment.